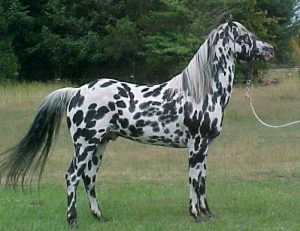 One of the most outstanding features of the Appaloosa is its colouring. The spotted coats that this breed possesses make each one look distinctly different. Aside from this it also has some other outstanding features, like the striping on the hooves and the white sclera in the eyes. The base colour of the coat can be one of several different colours. It can range from being black to palomino, with several other colours in between, then layered on top of this are patterns which also can vary. The body of this breed is compact and it has a broad head compared to some of the other breeds. Its strength can be seen in its broad shoulders. The legs are proportionate to the size of the body and have good strength. The gait of the horse is smooth. This breed of horse does well on the show circuit. It is commonly seen in western riding events. Also, it is used in English riding. The appaloosas perform very well at events such as cutting and roping along with barrel racing. They do well at show jumping plus fox hunting. Almost every breed of horse has some genetic health issues that can create different levels of concern. For this breed, they have a bigger risk of suffering from Equine Recurrent Uveitis. This is a condition that affects the eyes. It is common in all breeds but the Appaloosa is more prone to it. This breed has a good nature. They do have a lot of energy and many that own them consider this breed to be quite intelligent. For horse riding beginners the appallosa may not be a good choice, unless they have been well broken in.